Well, at least the moment Mark has been waiting for. And Ian. TagLib 1.4 is out. Try to refrain from foaming at the mouth. I know there's little more exciting than a meta-data library to really get your blood pumping on a slow Wednesday afternoon. So, I decided to join in the fun today, after much of the hard work has already been done. In a few minutes I ported KSig over to KDE 4. It's not a real port in the sense of it was just screwing around enough with it to make it compile -- Qt 3-isms still abound, but I thought I'd play with a nice-small-toy-ish app to start off before jumping in full swing. I'll probably continue and clean out all of the Qt 3-ness there for practice. Tomorrow a small batch of us will congregate in northwest Germany for the second Appeal meeting. Living rooms are overrated. My next apartment is so going to have a studio / computer / theater room instead. My living room gets little use other than having hosted about half a dozen KDE folks for various lengths of time. But my bedroom is getting overcrowded. Those who have been subject to my rants on this topic before are no doubt familiar with my views, but as they've mostly been on IRC and not particularly structured, and there's been some prompting in the KDE community in the last couple of days, so here goes. I'm too lazy to register to post comments, so I'll just go through Derek's post more or less point by point. KDE's culture is one of our most important assets. It's also one of our worst enemies. 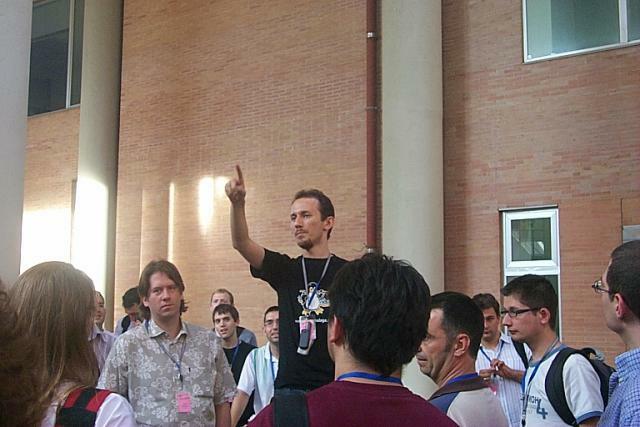 KDE's culture has been ideal to bring us to where we are today. More or less, our goal for years has been to produce a desktop -- something that can actually be called a modern desktop. And now we've got it. Yes, that's right folks, it's the Ministry of Silly Hats. A privileged few of you have been subjected to my gests on the acquiring of an appropriate sombrero de Tejas and well, guess what Santa Claus, err, mom, brought me this year? None other than a Stetson. Lyle Lovett eat your heart out. And Monty Python too while we're at heart eating. Headgear was in this year, below are featured my brother's girlfriend, myself, my brother and finally my sister (who'd taken to amusing herself with a sash that I'd brought her from India).